Get to know Ville Husso. The Roadrunners certainly did. 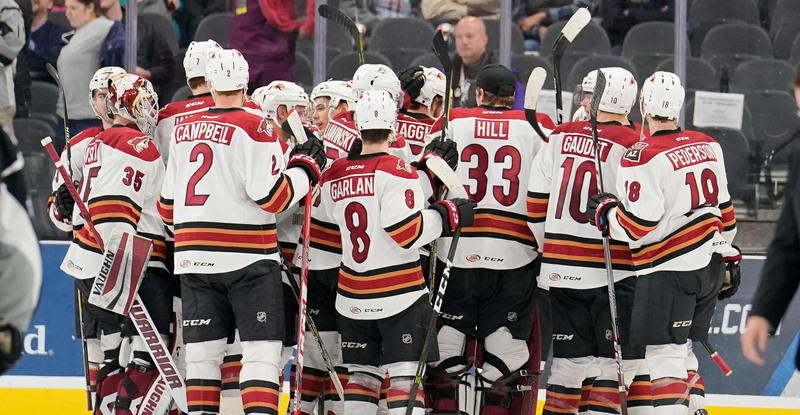 It took 55 shots, but Tucson finally wriggled its way past a stellar opposing goaltender to secure a 2-1 overtime victory over the San Antonio Rampage Friday night at the AT&T Center. The club set a new franchise record in shots registered in a single game, topping their previous high-mark of 52 set on December 16, 2017 in Ontario. They came firing from the start Friday night, totaling 22 shots in the opening frame, which also matched a franchise record. 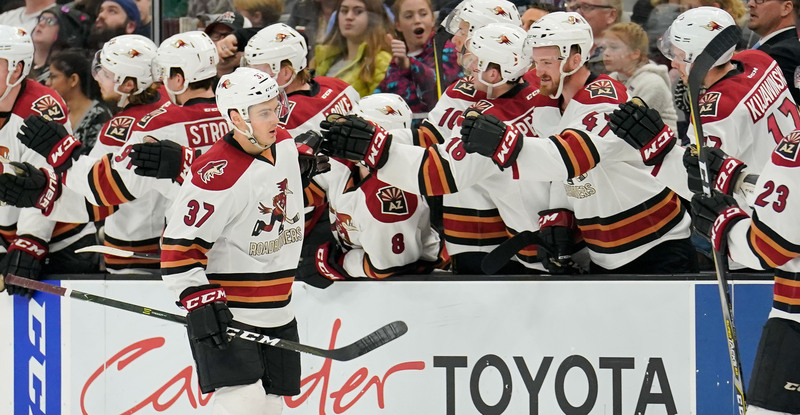 Despite outshooting San Antonio by a 22-5 count in the first, the Roadrunners found themselves down by a 1-0 score heading into the second period. The Rampage’s Chris Butler found the net with 1:36 left to play in the first to open the scoring. With less than five minutes to play in the second period, and coming on the team’s 32nd shot of the game, Dysin Mayo finally got the Roadrunners on board in shoveling home his third goal of the season. Mayo, after driving to the net and continuing to do so after handing a pass off to Michael Bunting, jammed home a loose puck past to tie the score 1-1 with 4:55 left in the middle frame. With the secondary assist on Mayo’s goal, Mike Sislo extended his team-leading points streak to six games. The Roadrunners outshot the Rampage 18-8 in the third, put couldn’t execute for a go-ahead goal. They outshot San Antonio by a 52-18 count in regulation. With just under two minutes to play in overtime, Mario Kempe dropped a pass off for Kyle Capobianco upon entering San Antonio’s zone. Kempe immediately opened up for Capobianco’s return pass, and upon tracking its route back, one-timed a shot - the team's 55th of the evening - past Ville Husso to score the game-winner from the right circle. Hunter Miska stopped 19 of the 20 shots he faced to earn his 12th win of the season. He is a perfect 4-0 in overtime games. With a 21-12-2-1 record, which calculates in a .625 win percentage, the Roadrunners remain at first-place in the Pacific Division. The teams will meet again on Saturday night at the AT&T Center, where the puck is scheduled to drop just after 6:00 PM MST.